Printed in white ink on front: "Main St. from Depot; T -1-14; 11; Killam" Main Street from Grand Trunk Pacific Railway train depot. Frizzells, Palace Rooms, Lynch Bros., and Empress News Co.
View of Main Street looking towards the Hudson Bay Mountain bluff. Businesses seen in the photograph include Chishom's Hardware, and the Telegraph building. 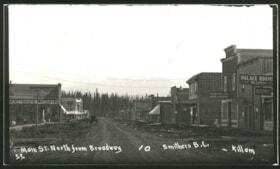 Main Street view from Broadway, Smithers, B.C. Title is based on photograph contents. 1 photograph: b & w; 15 x 9cm. Photograph is a modern reprint. 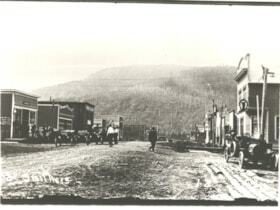 Main Street from Second Avenue, Smithers, B.C. 1 photograph: b & w; 15 x 9.5cm. The Smithers Cafe was run by Stickney and Drummond and was between Second and Third Avenues on Main Street. It was still in a tent in 1913. The Tribune Office was built in 1912 and was later occupied by Beerda's Dry Goods. H.F. Noel was a grocer circa 1913. 1 photograph: b & w; 12.5 x 10cm. Part of Main Street, Smithers, B.C. 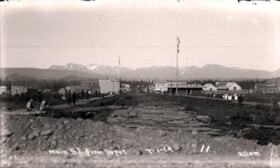 The Bulkley Hotel, Main Street, Smithers, B.C. Title based on information written on back of the postcard. 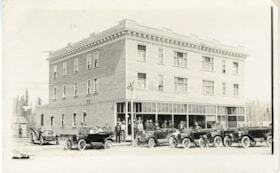 The hotel opened in 1914 and was built by the Carr brothers. R.E. 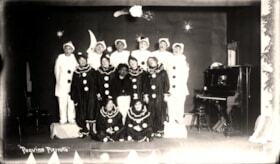 Williams bought it in 1918 with Ed Orchard as the manager. 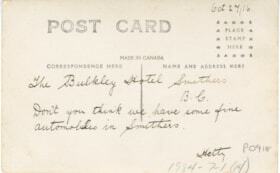 Written on the back: "The Bulkley Hotel Smithers B.C. Don't you think we have some fine automobiles in Smithers. [Hetty?]" 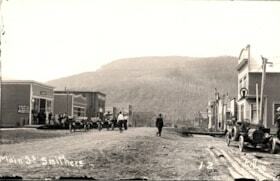 Main Street from Depot, Smithers, B.C. 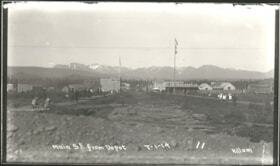 Printed in white on the bottom: "Main St. from depot; Smithers B.C. ; Killam". 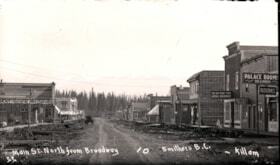 Printed on front of photo: "Smithers B.C. Main St. from 2nd. 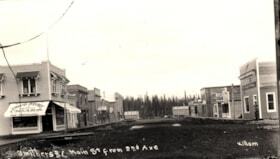 Ave" "Killam" Looking east from 2nd Ave. Business include the A. Chisholm Hardware, Union Bank of Canada, Hobberlin Tailoring (Noel and Rock), Smithers Café, The Smithers Tribune, Mac's Clothing Store and J. Mason Adams. 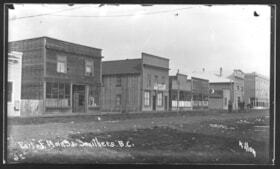 Businesses seen in the photo include Smithers Café and Mac's Clothing Store. Main Street North from Broadway, Smithers, B.C. Looking up Main Street from Broadway Avenue. 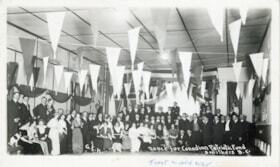 Sargent's General Store, J. Mason Adams Drugstore, Smithers Cafe, The Smithers Tribune, Hobberlin Tailoring (Noel and Rock), City Bakery & Confectionery, Gray Jewellery Co., The Red Front Store General Merchandise, Wilcocks & Wolseley Real Estate & Insurance, and Palace Rooms can be seen in the photo. Main Street from the Grand Trunk Pacific Station. Cars lined up along Main Street, Smithers, B.C. "Killam" printed very faintly on bottom right hand side. 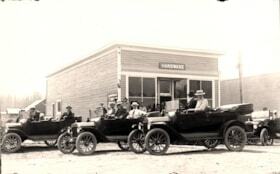 Jack and Pat Carr and William "Wiggs" O'Neill sitting in their cars in front of Chisholm's Hardware Store on Main Street Smithers. 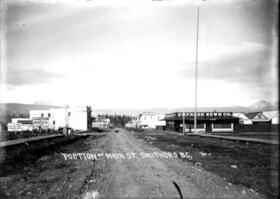 Main Street North from Second Avenue, Smithers, B.C. 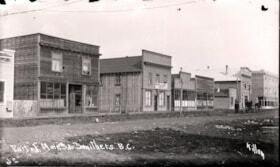 J. Mason Adams drugstore, Smithers Cafe, A. Chisholm Hardware, Hobberlin Tailoring (Noel and Rock), and Union Bank of Canada can be seen in the photo. 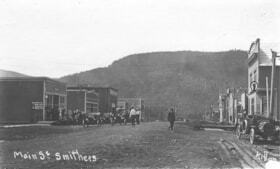 Portion of Main Street, Smithers, B.C. Portion of Main Street, Smithers, looking down from the train station. Businesses incude the Empress News and J. Kennedy's Pool Room. Epress News Co., Palace Rooms, Lynch Bros., J. 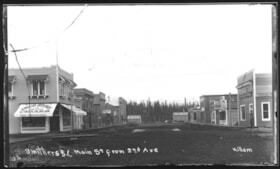 B. Kennedy's Star Pool Room, and Frizzells can be seen in the photo, as well as signs for Kraus' Barber Shop and Baths, Peerless Cafe, and townsite agents for Grand Trunk Pacific Railway lots. 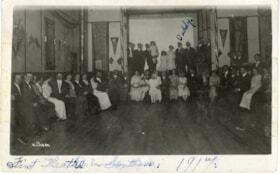 Possibly taken at the Old Town Hall on Main Street and Second Avenue.